Ever since I can remember, I loved to bake. Even throughout my busiest days of school, and then, later in life, raising my three beautiful children, I can’t remember a day that I didn’t think about a new recipe that I wanted to try or some delicious creation that I wanted to perfect. Enter French Macarons… I remember the first time I tasted one. I remember thinking, “How did they make this? !” It was so light, so delicate… with it’s barely detectable, but still so satisfying gossamer crunch and delicate chewy inside… and the brilliant flavors and colors! I was immediately hooked. As I set out on my journey to learn the art of making these elusive confections, I never considered where the path would eventually lead. I never pondered that I would spend the better part of decade perfecting my recipes, or that I would meet amazing people that heard of my macarons and would ask if I could make them and sell them, and I certainly never imagined when I tried and failed to bake my first batch, that I would someday be the ultimate destination for the best macarons in new Jersey. And yet, here I am today, with a vibrant busting little store in Dumont, NJ, that is always full of happy faces and warm voices all supporting the idea that I can “Bake the World a Sweeter Place” one cookie, one cake, or one brownie at a time if that’s what it takes. And to think, it all started with one little French Macaron. 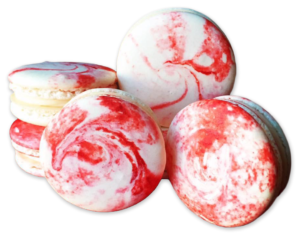 So if you are in our part of the world, we hope that you will come visit us and experience why our modest Dessertery offers so much more that the Best Macarons in New Jersey. Hope to see you soon!